To thousands of Estonians, the fire that destroyed much of Notre-Dame de Paris cathedral on Monday night has special significance thanks to writer Victor Hugo's novel, The Hunchback of Notre-Dame, having been required reading in secondary school for decades. The story was among the few works of Western literature that was officially sanctioned and even promoted in the USSR. Along with Émile Zola's Germinal, the Hunchback was one of the most popular books on the required reading lists of schools in both occupied and post-occupation Estonia. Perhaps building on the popularity of Hugo's work already in Imperial Russia, both writers were roped in by the Communists as witnesses of the fate of the proletarian classes in the West. What a quick look at the listings of a second-hand bookshop in Tallinn reveals is in itself interesting: the translation of the Hunchback in print and in school use at least until the end of the Soviet Union was done by Johannes Semper, an Estonian writer, poet, translator—and Communist politician. Semper also wrote the lyrics to the anthem of the Estonian SSR, among other more politically inclined works. Semper's translation is the only Estonian one to date, and was in print until at least the year 2000. The Hunchback remained on required reading lists well into the 1990s, which means that there are now several generations of Estonians whose memories of their younger days include the story. This might explain the emotional shock the fire triggered in some, including Parisian of 20 years, lobbyist, columnist and former advisor to Toomas Hendrik Ilves, Martin Kala. "Is it an accident that the cathedral burned and collapsed right on the day Easter festivities are beginning?" Mr Kala asked, "in a sombre tone" according to ERR's Toomas Sildam, who talked to him on Monday evening. "We are looking on as a symbol of France, a symbol of Europe is destroyed," Mr Kala added. "An old man in Paris, who survived World War II, told me that this [tragedy] we're witnessing is the end of ends." Seeing as it is a cathedral that has burned down, Archbishop Urmas Viilma of the Estonian Evangelical Lutheran Church (EELK) was quick to publish a statement as well. 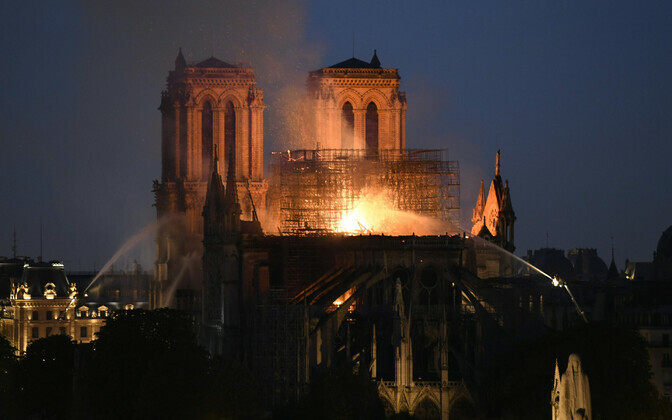 Mr Viilma called the fire a "tragedy" for Christian believers, Catholics, historical architecture, art and literature, Parisians and the French alike.